Last modified on 7/30/2009 3:50 PM by User. The goal of this article is to aquaint you with the basics of WikiBlock usage. The simplest WikiBlock would consist of a static chunk of html to be inserted in a wiki page. This example increases complexity by adding a string data element, which the plugin wraps in some html tags when the page is displayed. 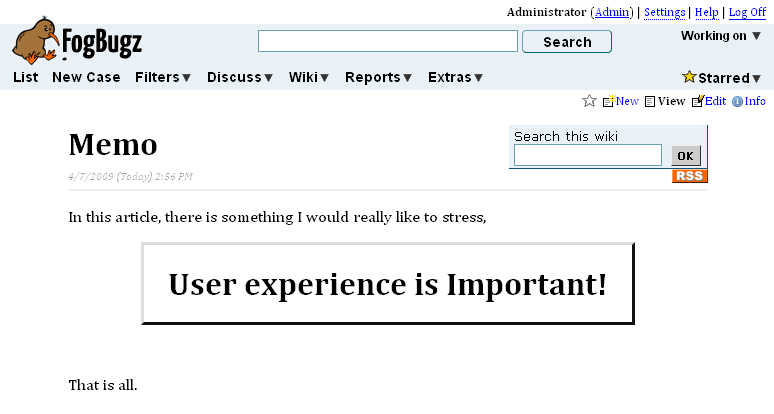 This plugin allows the user to insert a big, dramatic box with some large text into a wiki page. It achieves this by defining a string data element to hold the text and implementing the ViewHtml method. WikiBlock takes care of adding a link to the Insert Menu and creating a Dialog where the user can enter the desired text. The dialog is automatically populated by the data elements we define. Additionally, because we want a dynamic label for the WikiBlock in edit mode (as opposed to the default static name), we override the GetWikiBlockTextPlaceholder method and include the user's text in the block description. 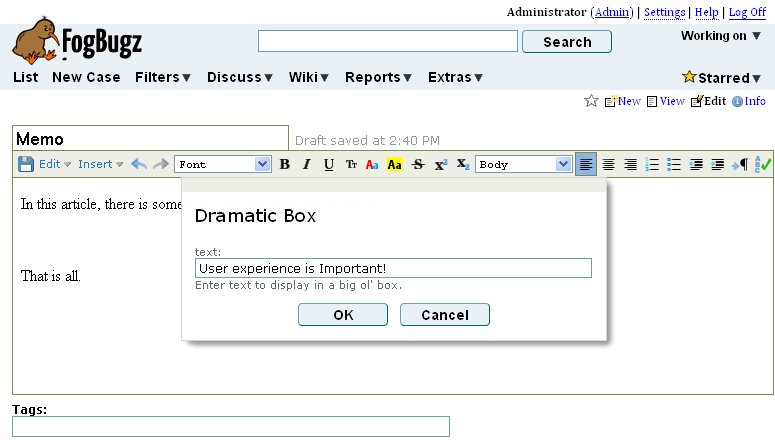 When the user selects "Dramatic Box..." they are presented with a Dialog. 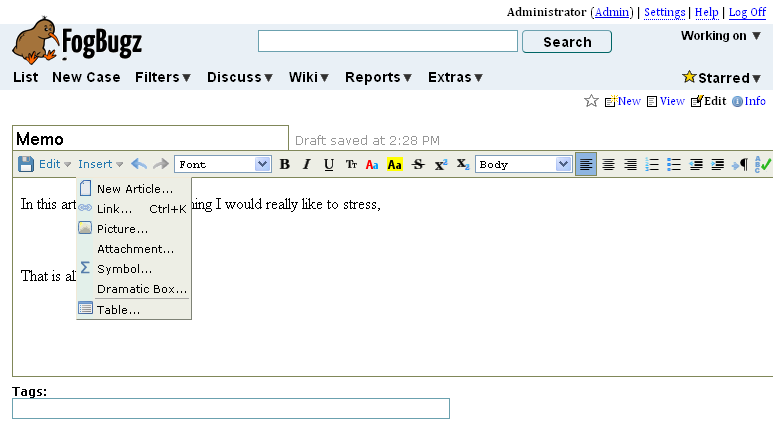 The title is defined by the same DisplayName as the Insert Menu link. Any class properties defined with Data attributes are automatically used as form fields in the Dialog. The label for the field is the name of the variable and attribute parameters determine the instructions text and other properties. If you need more flexibility, you can override the GetDialog and AddDataDialogItems methods. To use a static name for the block in edit mode, just add a TextPlaceholder parameter to the attribute mentioned above. For this plugin, we want the user to see what text was entered, so we implemented the GetWikiBlockTextPlaceholder method. When the page is displayed or edited, the plugin replaces that tag with the appropriate html. Try out another WikiBlock implementation: Intermediate WikiBlock Example. 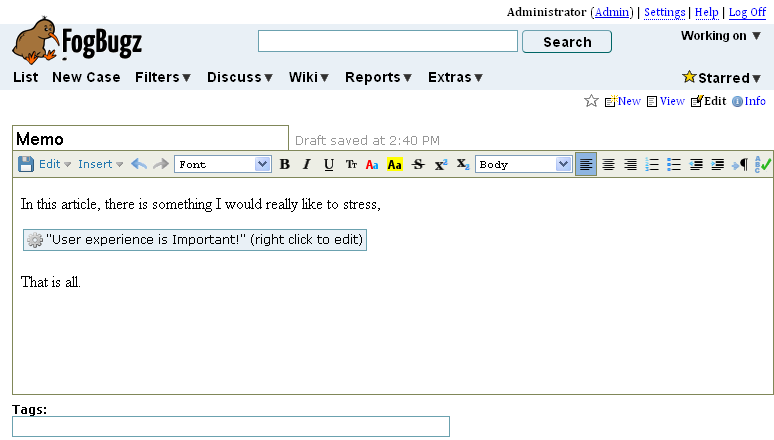 Or read more about WikiBlocks: How to embed a widget in a wiki page.